Perhaps the Best Biscuits Ever? It was my first night back in my own kitchen but thanks to jet lag, I was far from ready to put a lot of effort into dinner. I put my husband in charge of grilling some meat and I managed to make a decent-tasting side dish out of some canned beans, frozen vegetables and rice. But what I really wanted was something warm from the oven, dripping with butter. I started flipping through my latest cookbook, a gift my cousin brought me from a recent trip to Wisconsin, called Best of the Best from Wisconsin. I would have been satisfied with any of the quick muffins or corn bread recipes I found but I realized we had no eggs. Then I found a variety of quick and easy beer bread recipes that sounded good, but we had no beer. That’s when I saw it: a recipe for Cheese Drop Biscuits. Quick. Easy. Cheesy. It was exactly what I needed and I had all five ingredients on hand! Then I started thinking about the Sour Cream, Cheddar and Chive Biscuit recipe that I had been planning on revamping for quite some time. Next thing I knew, the five ingredients had turned into ten, the cheese drop biscuits were now sour cream, herb and and cheese rolled biscuits, and my kitchen smelled so good I’m surprised the neighbors weren’t knocking on my door. A new Pinch My Salt recipe was born! Even though the ingredient list doubled in size, these still go together in minutes. In fact, if you aren’t careful, the biscuits will be ready to go before your oven is even finished preheating! I decided to add a combination of herbs to my biscuits rather than sticking with just chives and this turned out to be a very good idea! Any combination of herbs would work great, I just happened to grab some dried basil and marjoram this time around. 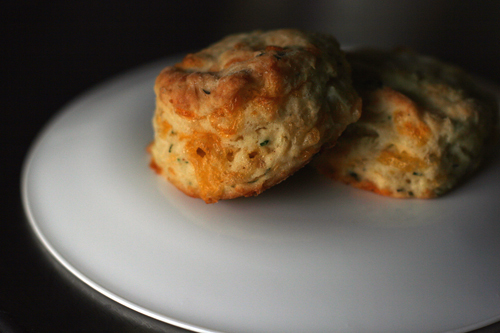 These are some of the most tender and flavorful biscuits I’ve ever tasted. The best part was that they tasted even better the next day! I never like to eat leftover biscuits so this was a wonderful discovery for me. Granted, these are not the healthiest things I’ve ever made–there’s a reason they taste so good! But it’s ok to splurge sometimes, right? You only live once! 2. In a medium bowl, whisk together flour, baking powder, baking soda, mustard powder and herbs. 3. Using a pastry blender or your fingers, cut in butter until mixture resembles coarse crumbs and the pieces of butter are the size of peas. Stir in shredded cheese. 4. In a small bowl or measuring cup, mix together sour cream and milk. Add sour cream mixture to the dry mixture. Stir until just combined. 5. Turn dough out onto a well-floured counter and knead a few times with floured hands. Pat dough out with your hands to about one-inch thickness. Cut biscuits using a biscuit cutter or cut into desired shapes with a knife. 6. Bake at 450 degrees for 12-15 minutes until golden brown. *You may use any combination of herbs you want. I like to use 1/2 T. fresh chives along with some dried herbs like 1/2 t. basil and 1/2 t. marjoram. The amounts listed are just guidelines. Experiment and have fun! Sift flour and baking powder; cut in remaining ingredients. Mix and drop by teaspoonfuls on greased baking sheet. Bake at 450 degrees for 12 – 15 minutes. These look great! I'm intrigued by the inclusion of mustard powder. I think you're onto something grand. I was just looking for some type of roll or biscuit recipe to make with dinner tonight, and nothing was sounding good until I read this!! This is perfect! Deborah: Glad I could help! Oh, man. I saw the photos of the biscuits while perusing the volcano images, and have been hungry ever since. Those look great. This is a lovely scone (as we call it here in Oz). I love the herb that you have added. Perfect! Cheese infused biscuits, that's what I'm talking about baby! They look YUMMY! Easy enough and I'm sure I have all the ingredients. Plus, it's cool again here so I can use my oven again! Thanks! Ruby: Glad to hear it's cooling down there! It's nice here, too. That 106 degree weather was killing me before I left there! Those do sound like the best biscuits ever! Pretty much anything baked with cheese would be okay with me! Nicole! You're back in the kitchen in a big way. These sound fabulous, better than the original recipe, in fact. I think herbes de Provence would be fabulous in these, by the way. Scott: You're right, these would be great just about anytime!Lydia: I'm a pretty big fan of anything baked with cheese, too!Kevin: Thanks! Hope you get a chance to try them :-)Terry: Yes, they were definitely better than the original recipe! I think you're right about the herbes de Provence. Have ya'll ever heard of White Lilly Flour? My grandmother made the best buttermilk biscuits I've ever had. A few years ago I started experimenting with biscuit recipes and they never came out nearly as great as hers. My mother told me granny had used White Lily flour. I tried to find it and couldn't in any grocery, wholefoods etc. It is apparently even in Wal Marts in the deep South where I grew up but nowhere west of the Mississippi. I finially found it on line at Chef's. I actually order $100.00 worth at a time to get free shipping. I can't say enough about the difference in it and other flours. Carmen,Yes, I have heard that using White Lily flour makes all the difference in biscuits. I am from the west coast so I have never actually used it but I do know that White Lily flour has a lower protein content than other 'all-purpose' white flours and that is what makes the difference in tenderness in biscuits, pie crusts and quick breads. I have read that a good substitute if you can't get white lily flour is to mix all-purpose flour with some instant flour (such as Wondra), I think the ratio is 2 parts all-purpose to 1 part instant flour. I don't bother with this because being from California, I'm just not that picky about my biscuits (I'm sure if I knew what "real" biscuits tasted, I would be a convert!). Thanks for letting us know that White Lily flour is available online through Chef's. I love that site! Yikes - those look dangerously good! I'm definitely going to give these biscuits a try. I love biscuits and these look delicious. Glad to hear they taste great the next day too as we always have leftovers and most biscuits don't taste all that good when they've been sitting around. These look yummy! Mallow: Thanks!Heather: I hope you do try them! Let us know what you think!Katiez: I know, biscuits are one of those things that just aren't that great reheated. But I thought these were good the next day--both cold and reheated!Rain: Please let me know what you think if you end up making these. Thanks for stopping by! Yes...the best biscuits ever! I'm surprised there were any leftover but we did manage to not eat some of them so we'll be trying them out tomorrow. Thanks for a great recipe for biscuits. One of my great pleasures in life is a good biscuit - I'd rather have that than a donut. these really do look like some superb biscuit! i am true southern biscuit lover and would happily gobble down several of these! they look great nicole! Amazing! We used Giusto's Organic Unbleached All-Family Wheat Flour (their version of all-purpose) and the crumb and texture were perfect. We used white cheddar (looks like you used yellow?) and didn't have mustard powder but will use it next time. Delicious with a poached egg! Rain: I hope you enjoyed them the following day, too! I thought they tasted pretty good the next day, something that is very unusual for a biscuit! It must have something to do with the sour cream.Pam: I hope you were able to make them!Amanda: Thanks! Coming from you, I'll definitely take that as a compliment!Mariangela: Yeah! I'm glad you finally got to make these. I'm sure they were wonderful with white cheddar. I think I actually used some colby jack because that's what I had on hand. I would usually opt for an extra sharp cheddar in something like this :-) I've never heard of that type of flour, I'm going to look it up now. I went up to visit my fiance at college and his caffeteria had these wonderful cheesy herb biscuits, but I didn't get a chance to ask for the name. This recipe sounded exactly like what I was looking for, but they turned out even better! I would have to agree on the mustard powder doing the trick. These were delicious. I can't wait to make these biscuits, but what flour is best to use? Is a regular all-purpose flour ok? i am totally going to make these at 9:30 at night and EAT THEM. it's my birthday so calories aren't real today. TRUE FACT. i have a printout of this recipe sitting on my fridge and make them at least once a week. my husband loves them soooo much and requests them all the time. And I bring them to/make them for dinner parties and people are always in love with them! great recipe, and fun to make variations of. These are baking in my oven right now! They came together so fast (which was just what I needed). I can't wait till they're ready! Made these last night. I had been looking for an herb biscuit since moving from Durham, NC to the West coast. I really wanted a recipe to imitate the unbelievable herb biscuits at Foster's Market http://www.fostersmarket.com/. Thanks so much! These did the trick. The only variation I made--and this was to imitate the Foster's biscuits--was to add coarsely chopped scallions instead of chives. So wonderful! Truly easy and yummy. Makes only 1 doz/ Very dry recipe, needs to be worked on the counter so it comes together. Forgot the mustard. Super tasty.